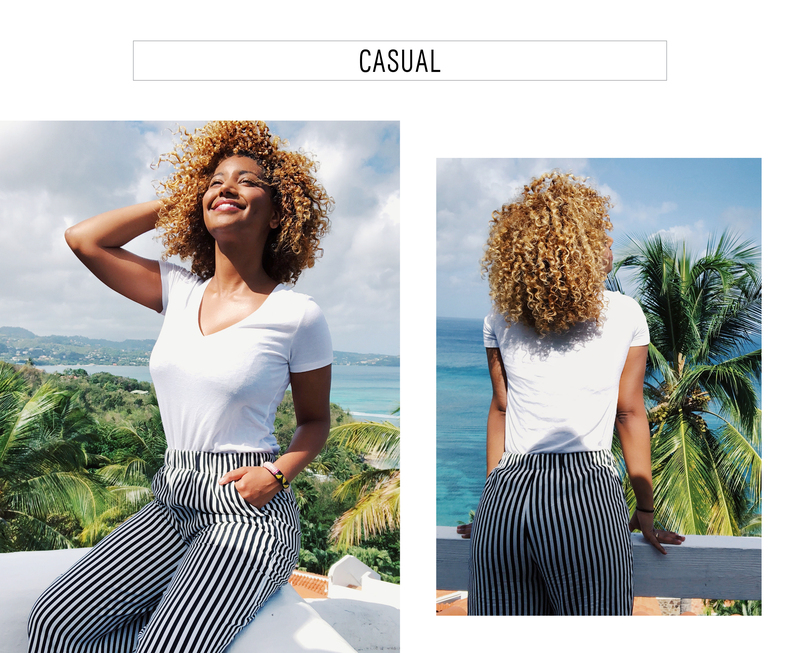 This week, René Daniella of Own by Femme, shows us how to style floaty, gorgeous wide leg pants especially when you’re trying to pack and travel light for a summer vacation. 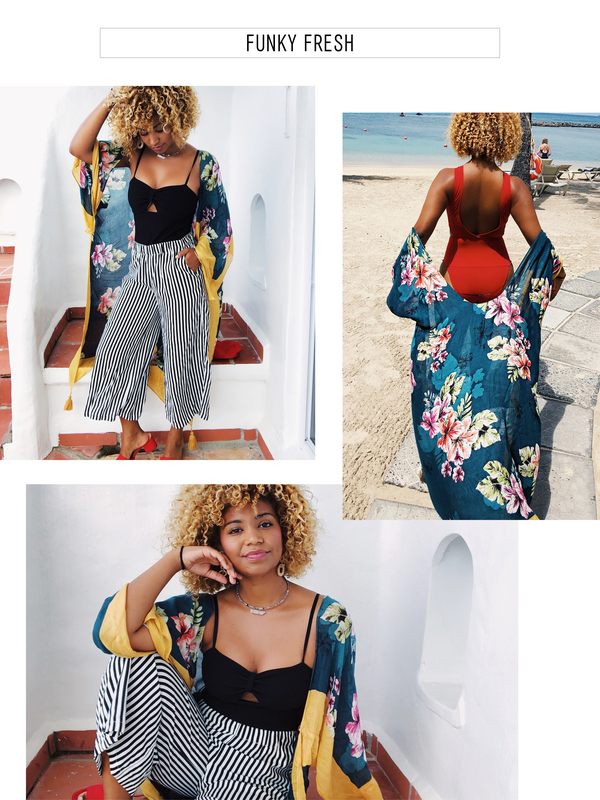 See her tips and tricks below (hint: it involves plenty of bodysuits and one amazing kimono) to help get you through customs and onto your next beach break. I am in love with the high waisted, wide leg pants trend! I have them in all different colors, designs, and cuts, each offering that flattering, stylish and chic look. With my insane travel schedule (I’ve been to 4 continents, and 8 different countries in the past few months alone), I just can’t afford to over pack my luggage. I wish I could live like they do in the old movies where you see the bellman helping some fabulous woman out of her car, loading bag after bag after bag onto the trolley, all sizes and shapes, hat bags, suit bags, shoe bags, you name it. But that’s not my life (haha!) and I don’t think it ever will be. I have to pack smart! Very, very smart. I keep a little bag of basics like safety pins, double sided tape, and stain remover to help recover from any mishaps. But after that, my tip for the best ways to make a wardrobe work, is by taking staple items and styling them differently to create completely new looks. To give you an example, I picked up this really fab pair of black and white striped wide leg culottes from @Express and have styled them three different ways: Casual, Classic, and Funky Fresh! I really love black and white patterns as you can make them the centre of attention or you can pair a bold color to them to make the whole look POP. Let me know what you think of these styles! For my classic look, I made the culottes the main focus and paired them with a simple black top. It’s a bodysuit and I LOVE the fit. I would definitely recommend you grab a couple to keep in your wardrobe. It has super cute detailing with a cutout in the front. You can pair with sandals or heels to make the look day or night time ready. The black and white culottes even go well with a good ole’ v-neck t-shirt. I could easily wear this on the flight or for a casual day outing with some sneakers. You really want looks like this on hand for days where you’re doing a lot of exploring. You’ll feel comfortable but still have that element of style. Patterns, oh how I love them so. I am a huge fan of mismatching patterns and designs. I took the classic look and turned it bold with a beautiful yellow and teal, floral print Kimono. This kimono is so versatile also! I wore it as a beach cover up, cinched it with a belt and wore it as a top, and then wore it open like this as a shell or jacket. I love the way these colors mix. It’s fun, vibrant, and gives a whole new vibe to this look. I would have no problem rocking these looks on my next vacation or work trip. Stock your wardrobe with a few bold pieces, the basic tees and tanks, and some great accessories. You will be set!